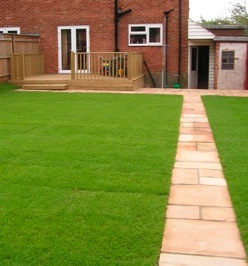 As experienced suppliers of landscaping products, Rance Landscapes has several different types of topsoil for sale, and can advise you on their use for your garden landscaping project. Please see below for the different types of top soil we offer and don't hesitate to call us if you require additional information on which topsoil for sale is suitable for your requirements. Our Soil blend is a mixture of screened top soil and compost. This type of soil is suitable for borders and vegetable patches, as it is highly fertile to aid positive growth. Turf Lay Soils is a reclaim soil screened to 10mm to dispose of any large pieces of waste. Any waste smaller than 10mm can make it into this product but it is an excellent choice for levelling the ground for laying turf or filling in large holes. This is a high grade loam like soil screened to 10mm and blended with sand, suitable for seeding, greenhouse use, and any works requiring something extra special (specially obtained and brought into the local area). If you need to buy topsoil, contact Rance Landscapes and take advantage of our expericence as Landscape Gardeners and suppliers of high quality landscaping products to ensure that you purchase exactly what you need.